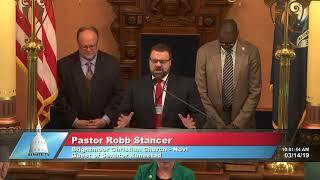 Senator Jim Runestad welcomed Pastor Robb Stancer of Brightmoor Christian Church in Novi to the Michigan Senate to deliver the invocation at the start of the March 14, 2019 session. Senator Jim Runestad reacted to Gov. 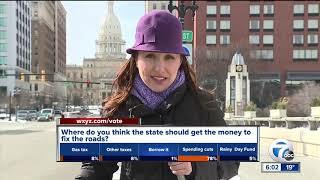 Gretchen Whitmer's budget proposal on WXYZ on March 5, 2019. 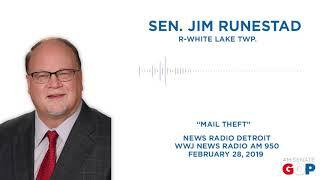 Senator Jim Runestad spoke with WWJ News Radio 950 AM to discuss his mail theft legislation on Feb. 28, 2019. Senator Jim Runestad discussed his mail theft legislation on WEYI on Feb. 28, 2019. Senator Jim Runestad joined Michael Patrick Shiels on The Big Show on March 1, 2019 to discuss mail theft in Michigan.